This man from India has did it again. Meet Santhosh from Mysore, India - Bringing innovation to bikes is what he does. 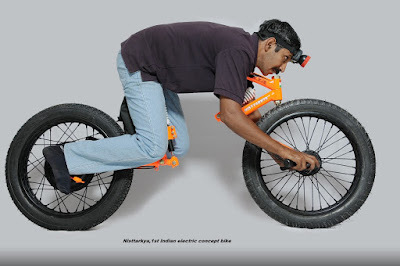 Known worldwide for developing the Moosshiqk (the Sanskrit word for mouse) world’s smallest electric motorcycle, Santhosh is here with another interesting project. 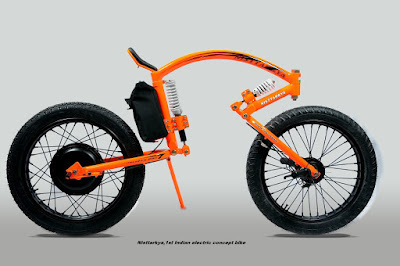 Called Nisttarkya, Santhosh has developed the first Indian electric concept bike. The most striking feature of the Nisstarkya is its unique aerodynamic riding position. The Nisttarkya is a 100-percent electric-powered bike created in India by an imaginative guy called Santhosh. It features a highly unusual riding position with the rider sitting crouched in the prone position. 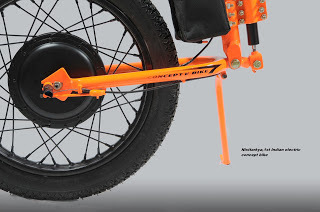 The handlebars are connected directly to the front wheel hub, and it features both front and rear suspension. It looks like riding the Nisttarkya would be extremely fun, dangerous and painful at the same time! Longer journeys or using it on any terrain which isn’t glass smooth could cause fairly severe discomfort for the rider, as pretty much all their weight looks to be distributed along the unpadded metal backbone frame. Also I’m not sure how happy I would feel with my teeth just a few millimetres from the metal frame! Still, with a few modifications to the ergonomics, and a bit more padding for extra comfort it could be quite an amusing ride. Powering the Nisttarkya is a 350Watt motor supplied by a 36V battery mounted just ahead of the rear wheel. The Nisttarkya weighs in at 40 kgs (88 lbs) – pretty heavy even for an electric bike. But for a prototype vehicle which is still in development it’s pretty good. Santhosh’s love for machines was evident from childhood. Financial restrictions and responsibilities did not allow him to pursue a full-fledged career in the engineering field, but he did not give up and created India’s first electric concept bike all on his own. Not only this, he has several mentions in the Limca Book of records for his various inventions. Meet the man who has the guts to follow his dreams. “Machines are the love of my life. Ever since I was a kid, I would find myself changing various parts of motorcycles. I guess I got this enthusiasm and passion from my father. He also loved bikes and inventions. Sadly, he is no more with me today but his inspiration keeps me going,” says Santhosh. He does a regular job in a pharmaceutical company, supports his family and still finds time to create world records. He does not hold an engineering degree but has his name registered in three world records for his amazing bike designs. 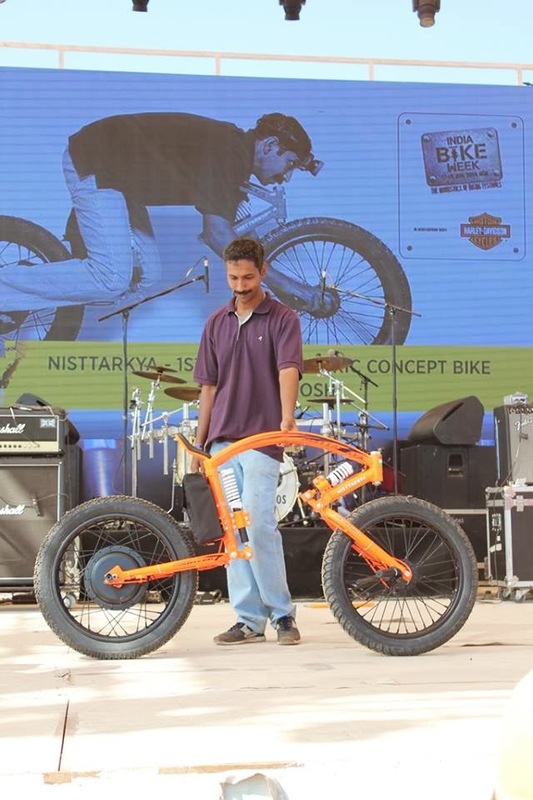 Santhosh, who has three entries in the Limca Book of records for designing various innovative bikes, does not even have a professional degree. He completed 10th grade and did an ITI course after that. Born in Moddigiri in Dakshin Kannada, he moved to Mysore when he was a kid. “It was my dad who inspired me to work in this field. He filled his enthusiasm and love for bikes in me,” Santhosh recalls. Though financial restrictions posed an obstacle for him to follow his dream, Santhosh did not give up. He continued his studies and pursued his passion simultaneously by participating in different rallies, repairing old bikes and learning & researching about them. His love for bikes even took him to the Himalayas, where he participated in two bike rallies. The sitting position in this bike might be affecting the line of sight or more accurately, the span of vision. A person here can only see what is exactly in front of him and that is not enough. Also it might be very difficult to maintain balance and ride in this way. Indian Roads everyone knows and the potholes and ditches will make the ride more than bumpy. It can also increase threat of Spondylitis or whatever that disease with issue in vertebrae column is called. It’s mainly caused due to repeated bumpy rides. I believe that it will be able to improve this model and then there might be a nice place for it in the market. All in all, nice effort and really an innovative idea from this crazy guy!